My North Florida world is about to change. Dark billowing clouds suspend above the earth—a cold front is on the way. Hurriedly, I move pots of anthurium from the pool deck to the living room for a warm transition into spring. 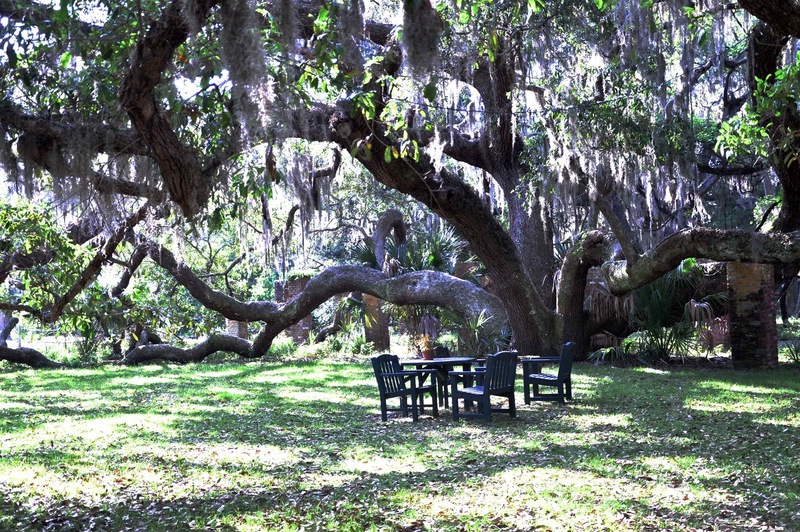 In Alachua, “Latchuway” according to locals, tropicals don’t survive outdoor winters. A gust of wind rattles the trees and spills handfuls of confetti-colored leaves. Flame red crepe myrtles, magenta dogwoods, and golden oaks. Alachua autumns inspire a Miami girl who grew up thinking such color transformations only happened “up North,” in colder climes. A leaf in salmon shades floats down onto the birdbath. Yellow butterflies circle purple lantana and sip nectar from wine-colored periwinkles. Satsuma branches hang like willows, heavy with mottled orangish fruit awaiting winter’s alchemy for transformation into golden oranges. A squirrel darts under a Margarita daisy bush to scavenge long-buried hickory nuts. Fresh sand mounds appear around the armadillo’s burrow in a far corner of the yard. Will anyone mind if she remains? Or if during summer drought, the deer munch the daylilies down to their roots? Ginger leaves, so lush in summer, rustle like brown wrapping paper. I pull up dried stocks of daisies, zinnias, and cockscomb, break off the seed heads, and shake them over upturned soil—the beginnings of next spring’s garden. My friend Wanda will arrive any minute. She can use the seeds, too. I jam desiccated plants and stacks of plastic seedlings pots into a yard bag to await her arrival. I add other garden treasures for Wanda’s collection. Amaryllis, epiphyte orchids in baskets and terrestrials in soil pots, a small Meyer lemon, and three knock-out roses. In the distance I imagine golfers, a ruckus of laughter, curses, and whizzing balls. No fairway chatter today. No games. Course closed. For sale. A sign of the times. 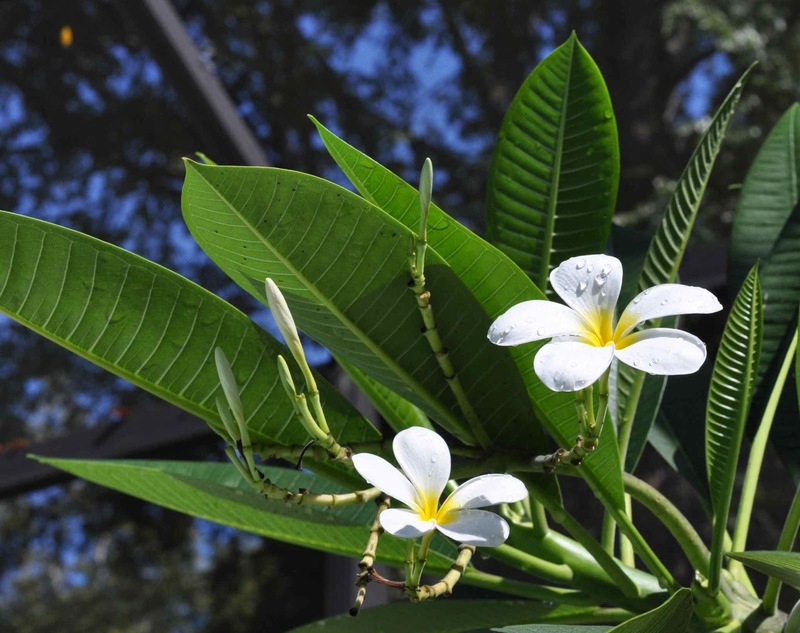 Don’t forget Wanda’s frangipanis, beautiful flowers in Hawaiian leis. We’ve had “Whitie,” our oldest, for twenty years. Her branches almost fill one side of the pool deck. Last summer, a smaller frangi swelled with multiple shades of pink flowers. In Alachua, whites grow more easily than pinks. This year Whitie won’t have her blanket and electric light bulb by the pool. Instead, we’ll pull her in close, under the roof, and wind her branches with sparkling Christmas lights for warmth and color. Will she stay warm? I set two young frangipanis by the lemon. Overhead, a gaggle of Sandhill cranes stream south in v-formation. Like colorful leaves, Sandhills are part of North Florida autumn. The pomegranate, another long-term survivor, beckons me. Now a collection of caramel-colored sticks with yellow leaf-fringes, in spring he’ll sprout orange tissue-paper blossoms. Wanda’s white pick-up truck pulls in the drive. Quickly we load the plants and garden tools from my garage, and then say good-bye. No more annuals or perennials for me. I have no need for tools. I’m moving to a new condo in Jacksonville. Like pomegranate and Sandhill cranes, I must transition. But will I survive there? Carla Charleston is a freelance writer from Jacksonville, Florida. Dr. Charleston was a professor and scientist in the field of communication sciences and disorders. She has published six books and over fifty refereed articles in her field. She is currently marketing her novel, Finding Faustena, the story of Americans rebuilding Naples after World War II. I try to cajole myself into thinking that chaperoning the fifth grade's overnight camping trip could be the closest I will ever come to experiencing celebrity. As a traveling teacher, working in four elementary schools, my presence on this trip is something like having a guest spot on a hit television show. My bunkmates, all eight of them, are inexplicably my biggest fans though I don't know them well. This, I assure myself, will not be like the overnight trips when I was in fifth grade. I blanch at the memory of my outward-bound trip to Wales when I came out of the bathroom to find Red-head Raaum waving my new bra out the window for a group of boys to behold. In the center of that crowd stood Lee. Our fathers worked together. Lee was from Alabama and would remain in my mind as the type of boy to avoid when I started high school in Atlanta. Raaum laughed, one strap dangling from her freckled finger. The stripes of the material caught the breeze in a way that reminded me of static on Gram's television. Mom had bought this bra for me as a surprise before my trip. Although it was of the training bra variety and I pretended to hate it, it was wild in its own way and I secretly loved it. Black and white stripes crossed the camisole as naturally as they would on a zebra and I felt a secret sophistication while wearing it that is not commonly experienced by chubby, frizzy-headed, pre-pubescent girls. I knew after Lee had seen it, I would never wear it again. Maddie dangled her head over the edge of her bunk, "Boo!" I was reading in the bunk below, trying to set an example that might inspire the girls to do the same. "Did I scare ya, Miss Silva?" "Lots of things about you scare me, Maddie." "Ha! Good one. Hey, check this out." She launched an envelope onto my sleeping bag. "Open it!" Maddie's swinging hair zigzagged shadows over my legs. I picked up the envelope and turned it over. "Maddie," a heart dotting the letter i, was written on the front. I recognized it as a mom note. "She must have tucked it into my bag. So embarrassing." I nodded and handed the envelope back. "You don't know embarrassing," I said. "When I was in sixth grade, my classmates and I went on a trip to Stratford-upon-Avon...that's where Shakespeare was born - Madison, your face is turning purple, can you please come down?" Her head disappeared over the bunk and she swung her legs over the edge, balancing her dingy toes on the stepladder before she hopped down to the floor next to my bunk. "So what was so embarrassing?" I propped myself up on one elbow. "When we reached the hostel...that's like a cheap motel for students...the manager welcomed us and called out our room numbers and roommates." "Then he asked if there was an Amanda Silva in the group." "Your name's Amanda?" Students are always surprised to learn their teachers have first names and that those names aren't Mister, Miss, or Mrs.
"Yes. Anyway, I raised my hand and he reached out to hand me three envelopes. ‘Fan mail,' he said. Each one of them was from my mother. She had sent them ahead of time." Maddie gasped. "Are you serious? Did you just want to die?" "I am serious and I didn't want to die until I opened the second one and this boy I hated, named Lee, read it over my shoulder... ‘Hey, Boo-boo!'" Standing there, I had smiled like it didn't bother me, but later on cried in the bathroom, embarrassed at the thrill I had felt seeing the mail, followed by the realization that mom was still the closest friend I had. Maddie raised an eyebrow, "Boo-boo?" "Call it a term of endearment, a nickname, whatever. Anyway, once he started calling me that, they all did." I remembered coming home from that trip, embarrassed and annoyed with my mother. I told her what the kids were calling me, thanks to her letter. She laughed. She thought it was cute and she became convinced that Lee had a crush on me. The next morning the girls came to life early. I played possum while they took turns in the bathroom and packed their bags. When it was finally my turn, I lingered in the shower, the only time I would be alone for the rest of the day. We were scheduled to leave later that afternoon and be back at Broad Street Elementary by early evening. I toweled off and wrapped myself in my faded bathrobe and twisted the threadbare towel around my head. Reaching for my toothbrush, I gasped at the sudden shrieking coming from the bunks. Toothbrush still in hand, I stepped out of the bathroom and into a throng of girls talking all at once. A few of them had come over from another bunk and seemed to have brought the commotion with them. "It was so gross! She threw up everywhere. Just all of a sudden-everywhere!" More shrieks and fake gagging noises as I held up my hands and attempted a "shh." Before I could ask who was sick, I noticed a chaperone from the other cabin marching up the stairs. I had never met her before and assumed she was a parent volunteer. She came in the room, slightly out of breath and smoothed back her hair. "Miss Silva, I understand you're leaving earlier than the rest of us today. Is that right?" "Yes. I split my time between four elementary schools, and this was all the time I could take away from my regular schedule. So, I'll be leaving after breakfast." She smiled and her shoulders relaxed. "Wonderful. We have a young lady who has been up since the crack of dawn, vomiting." "That is so gross!" Maddie shivered. The woman closed her eyes and inhaled deeply. I had the feeling she had been dealing with this all morning. "Do you think you could drop her off at school so that her mother can collect her sooner than later?" Though I wanted to shiver like Maddie, and dreaded the hour-long mountain drive back to school, I could say nothing besides, "Of course. I'll just get dressed and meet you at the cafeteria." As she left, the girls looked at each other and then me. Maddie, their unofficial leader, spoke up. "Miss Silva, what if she pukes in your car? It's over an hour back to school and the roads are all windy and...oh, I could puke just thinking about it." "Well don't." I flipped my head upside down and unwound the towel. Tossing the towel aside, I started raking a comb through my hair. "It's not her fault she got sick. These things happen. I'm sure she's embarrassed as it is. I know I was." The girls stopped giggling and zipping their bags. I had their attention. "Oh, yeah. I threw up on a school trip. It wasn't an overnight trip, but still. I got off the bus and puked in front of everyone-girls and boys. Teachers. Proper British pedestrians, who were just minding their own business." I smeared moisturizing lotion across my face, spreading my fingers down my neck and over my collarbone. Eight pairs of eyes watched me in the mirror. I knew that cosmetic rituals fascinated the girls, even the tomboys. But more than that, none of them could believe that I had puked in public. I dabbed tiny dots of concealer under my eyes, and bounced a mascara wand under my lashes. Although we were at camp now, I would be back in one of my other schools by noon and needed to return looking like my professional self. "You know what the worst part was?" They shook their heads, as though they were leaves on a single branch. That snapped them out of their makeup-induced reverie. "Why?" A quiet voice asked. "I hadn't eaten anything for breakfast. I had a nervous stomach and not eating can make that sort of thing worse. We got stuck in smoggy, London traffic, and one of my friends offered me a Sweet-tart. Those were my favorite..."
"Anyway, the only time we had American candy was when someone's parents brought it back, or a relative sent it over. So, even though I felt queasy I was excited when my friend, Becky, offered me one. I pulled the first bright blue one off the top." I couldn't remember the last time my students had paid such attention to what I had to say. The girls surrounded me, wide-eyed, as I explained that although I had actually made it to our destination, one of London's many art galleries, I hurried down the bus steps and moved away from my classmates, breathing deeply as I tried to stop an unstoppable force. I didn't succeed and as disgust met relief, I heard Matt yell, "Amanda is throwing up!" I had an audience, complete with pointing fingers. Matt nudged Lee in the ribs. By the time the regular school bus dropped me off in front of my house, my mother had already heard what had happened. I hadn't planned on telling her, but Lee made it to his house before I made it to mine. He announced the day's highlight to his mother who sat at her kitchen table drinking coffee with mine. "Boo-boo barfs blue!" Patting a tissue over my lipstick, I turned to face the girls, all in a semi-circle around the vanity. "Now, beat it so I can get dressed and hit the road. I'll see you in the cafeteria." The girls made a clumsy exit, shouldering sleeping bags and well-worn pillows, stuffed backpacks hunching them over, making them look like aged rag dolls. I zipped up the back of my dress, ignored the run in my hose, stepped into a pair of heels and soon followed after them. On the way to the cafeteria, I made a detour to my car, tossed my bag in the trunk and cleared the front passenger seat of books and to-go coffee cups. Slinging my purse over my shoulder, I felt something wet stick to my side. The cap of my water bottle had come loose and spilled whatever was left into my bag. I pulled my phone from the bottom, and groaned when I realized it had been marinating in a little puddle for who could say how long. Evidently, I hadn't whispered my string of obscenities as I had imagined. Mystery Mother had rounded the corner, eyebrows raised. "I thought maybe you were trying to make a clean getaway." She was holding plastic bags in her hand. I assumed they were for my companion to hold at the ready on our drive back. "No, I somehow spilt water in my bag and it drenched everything-my phone included." I held up the green Envy. She tried to help me dry the phone and all of its components, which I had hastily torn free of each other. I knew it was useless and I would have to factor a trip to Verizon into my day. Maybe if this hadn't been my first phone-death by water, I wouldn't have been so discouraged. I was losing track, but I think I had killed three in such a way thus far. This phone had, in fact, replaced my last waterlogged device. I noticed when she glanced at her watch. "Well, I better go say goodbye to the girls and find my newest charge." I was still new to the school, and since it was only one of four that I worked in every week, I didn't know all of the students yet. "She seems to be feeling much better, just washed out. The nurse seems to think she might have been dehydrated, too much excitement yesterday, and too much sun. Who knows?" I dropped my beloved, but drenched red leather HOBO bag with the matching wallet-a gift from Mom-on the front seat and waited for the car to chirp, "locked." We started back up the hill, towards the main building. "What's her name, anyway? I'm not sure I've met her." Dusting my sunglass lenses, I realized I still didn't know this volunteer's name. I tripped over an exposed tree root and nearly lost my footing. She gripped my elbow, steadying me. Later that afternoon, I stood in line at the Verizon store, clutching my casualty. When I made it to the counter, the clerk took my phone, cradling it as if it could be resuscitated. "What happened here?" His nametag said "Elvis" and he spoke with an Eastern European accent. "Water damage." I thought it best to keep my story simple. Elvis didn't share that philosophy. "I can see that. How?" He set the phone to the side and folded his hands. "I was on a field trip..."
"Aren't you a little old for field trips?" With a name like Elvis, I suppose one needed a sense of humor. He leaned back in his chair. "Well, I hope you took better care of the children than your phone." He fell apart on himself, a gangly, balding fit of laughter. My fifth grade self blushed beneath my makeup. Amanda Forbes Silva received her MFA from Vermont College of Fine Arts in 2012. When she is not writing, she teaches fourth graders, a population that offers her an abundance of creative material.